With the closure of coke-works around Australia, black smithing coke supplies are getting hard to buy. We would like to reassure our blacksmithing customers that we will continue to keep a good supply of blacksmithing coke for sale from our Adelaide Hills premises. The moisture content of coke can vary so we sell it by volume. Please CALL before coming to pick up to ensure availability and that someone will be there. Courier delivery can be arranged. Contact us for a quote (or use the above details to arrange your own courier). Coke is the fuel most preferred by blacksmiths, worldwide. Farmweld’s high quality coke produces low ash and is great for blacksmithing, AGA stoves, coke fired steam boilers, etc. Compared to charcoal and other combustible materials, coke is relatively smoke free as most of the volatiles are burnt out of it. This is important in any setting where air quality is imperative. It is an excellent source of heat for the forge due to the amount of heat it produces. NOTE: If you purchase coke with the intention of using it for any purpose other than in a forge, e.g. in a wood burner, furnace, stove or fireplace please ensure that these items are made to burn coke. Coke is not suitable for slow combustion heaters as there’s insufficient airflow to keep it burning. Any area where coke is burnt should have adequate ventilation, exhaust systems and/or in the case of indoor stoves a sealed firebox, as it produces high levels of carbon monoxide. 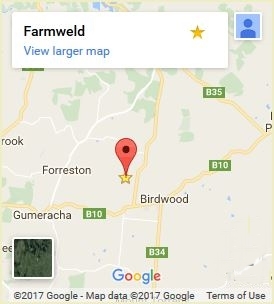 Farmweld is not liable for any damage caused by the use of this product. Prices are correct as at 17/7/18 and are subject to change without notice. Is your coke suitable to burn in a small outdoor brasier? No, coke is not suitable for braziers. It needs a large volume of air to be blasted through it to keep it alight. Most forges have blowers (or bellows) to keep the air circulating through. Coke also produces carbon monoxide. As such, emissions should be ‘flued’ away from the area.